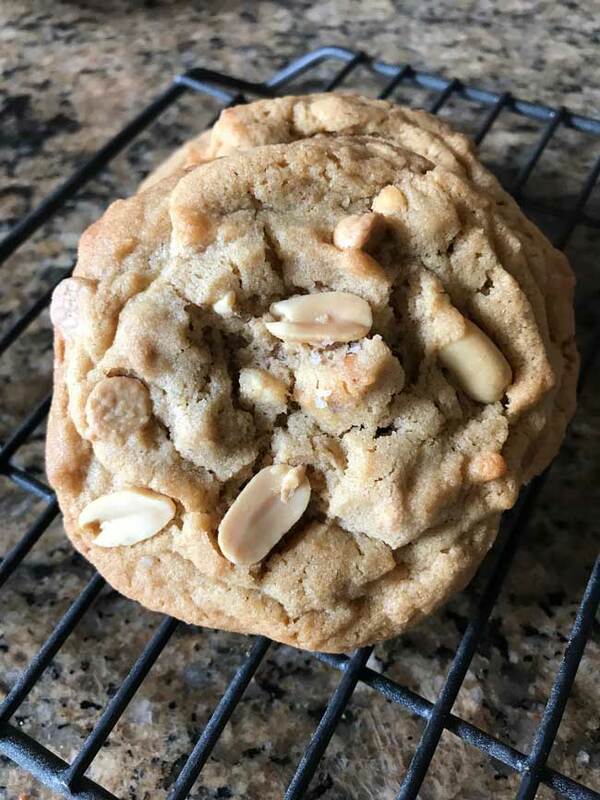 One of my favorite peanut butter cookie recipes is Cook’s Illustrated’s Super Nutty Peanut Butter Cookies, a cookie that gets extra flavor from peanut butter and finely ground nuts. Unfortunately, I don’t always have the motivation to pull out (and clean) a grinding apparatus nor do I always have the peanuts. And that’s how Peanut Butter Jumbo’s came into the picture. My friend Debbie shared the recipe and I had everything on hand to try it. Debbie is not sure of the original source, but it may be Midwest Living since they have it on their website. Whatever the case, neither Debbie’s version nor Midwest Living’s calls for salt. I like peanut butter cookies to be a little sweet and salty so I used unsalted butter and added 1 teaspoon of salt. Vanilla is also not in the original recipe, but I added a teaspoon and was happy with the flavor. And as for the flour, I weighed it and got 380 grams. If you can’t weigh your flour, make sure to really stir and aerate it before measuring. Here’s the recipe as I made it. I scooped up dough with a large cookie scoop, chilled the individual scoops, then chilled the individual scoops and baked up a few cookies for the family. The next day I baked more cookies for friends and still had pre-portioned balls of cookie dough in the freezer. It’s nice having cookie dough to bake on demand, but if you don’t need 33 cookies, this recipe is easy to 2/3 or 1/3. 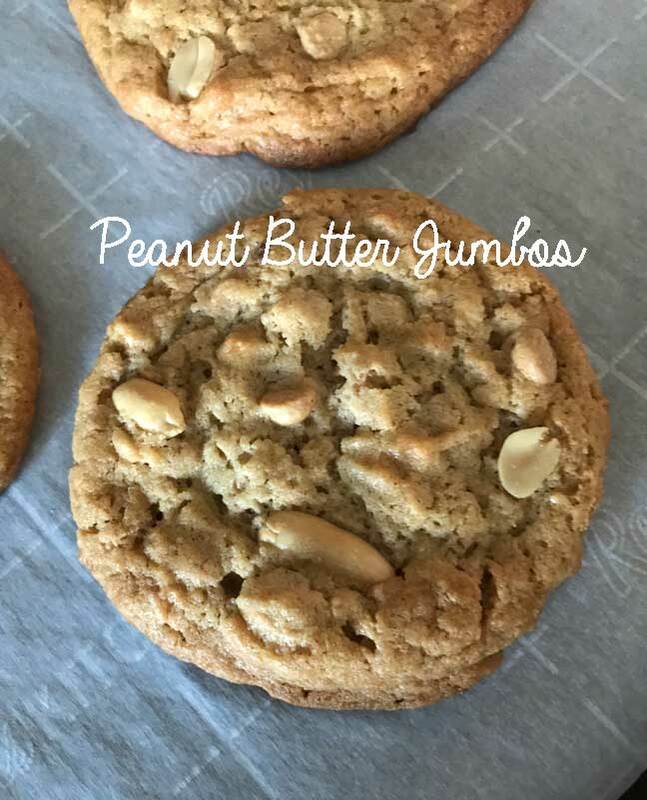 Peanut Butter Jumbos are dense, flat, chewy peanut butter cookies. 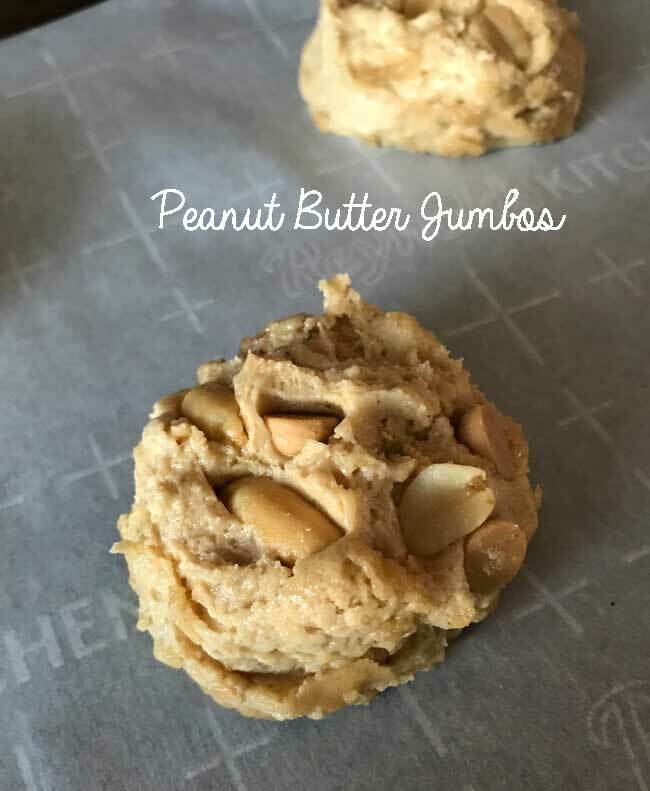 In a large mixing bowl, using an electric mixer, beat the softened butter, peanut butter and both sugars until light and creamy. Add eggs one at a time, beating on low speed after each egg is added. Beat in the vanilla, salt and baking soda, then add the flour and stir until it is fully blended. Using a large cookie scoop or a 1/4 cup measure, scoop up mounds of cookie dough and place on a couple of plates or small tray (something you can fit in the refrigerator) lined with plastic. Cover the scooped mounds and chill for two hours or until ready to bake. When ready to bake, heat oven to 350 degrees. Line large cookie sheets with parchment paper, or use ungreased cookie sheets. Arrange the chilled mounds on baking sheets spacing 3 inches apart. Press a few peanut halves into each cookie if desired. Bake at 350 degrees for 15 to 17 minutes or until the edges are very lightly browned and the centers seemed cooked bust still soft. Remove from oven and let cookies rest on the sheet for a couple minutes before transferring to wire racks to cool. If you aren't using a scale and are measuring by volume, make sure to really aerate the flour before measuring and measure with a light hand. It's best to just weigh it. Lisa, I’m glad you found it helpful. With 3 cups of flour it’s important to use the right amount. April, let me know what you think. The cookie seem better (as usual) when made with dough that’s been chilled for 24 hours. Also, if you want you can make just 1/3 or 2/3. Then you won’t have to halve any eggs. Try to stay cool! I will give these a try once Washington state’s heat wave breaks. It’s been in the 90s and we are not use to this! I will half the recipe. I just can’t make myself use nearly a pound of butter for roughly three dozen cookies. I look forward to comparing them to my current favorite peanut butter cookies.